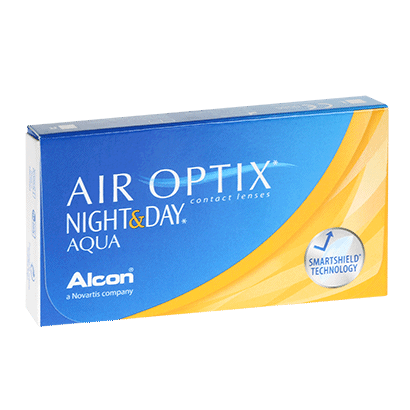 Experience total freedom with your contact lenses when you wear Air Optix Night & Day Aqua (6 Pack) contacts. 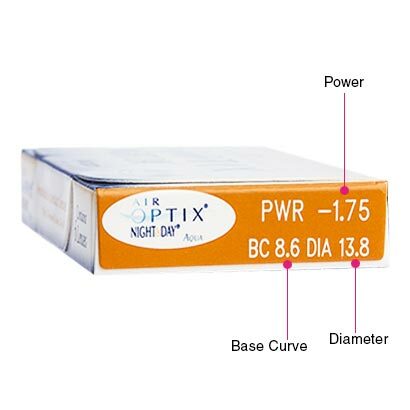 Part of the popular Air Optix range, these unique extended wear lenses allow up to 30 days and 30 nights of continuous wear (if approved by your optician). You won’t have to worry about a contact lens cleaning routine or removing your contact lenses before bed when you wear these impressive contact lenses from Alcon & Ciba Vision. This makes these exceptional extended wear contact lenses an ideal choice for busy lifestyles. You’ll have impressive lenses designed for continuous wear to keep up with your late nights, early starts and hectic work schedules. 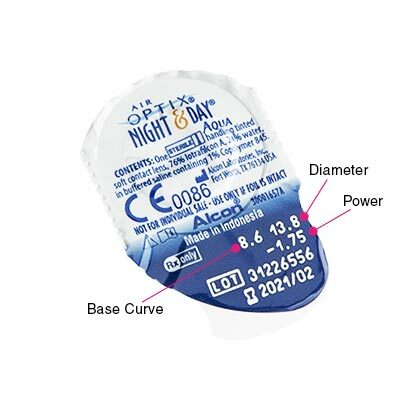 Made from silicone hydrogel, Air Optix Night & Day Aqua (6 Pack) contact lenses permit more oxygen to travel through the lens to your eye than hydrogel contacts. This helps refresh your eyes and prevent the onset of dry eye, keeping them healthy, hygienic and comfortable. The use of TriComfort technology also helps to keep the surface of these extended wear contact lenses smooth, clean and comfortable to wear. Moisture-locking qualities keep these lenses lubricated all day and night, allowing them to hydrate your eyes around the clock. With resistance to deposits and protein build-up, these silicone hydrogel contact lenses can deliver uninterrupted clear vision, while minimising the risk of irritation during wear. In the rare event that any dirt or irritant does make its way onto your lenses, you should remove them immediately, then clean and rinse them with a suitable contact lens solution. After that, you can simply put your lenses back in and go on enjoying clear and comfortable vision with Air Optix Night & Day Aqua (6 Pack) contacts. For a smaller supply, you can try our 3-pack edition, available for the guaranteed cheapest UK price when you buy contact lenses online at FeelGoodContacts.com. You can also try Biofinity, if your optician approves them as suitable extended wear lenses for your eyes. Air Optix Aqua are similar lenses, however haven't been specifically designed for extended wear. Used this product for many years.... the best thing I ever did!!!! Been using these for years, but due to the ever increasing purchase cost from my normal optician, looked for an altrnative source. As for the lenses, they really are great - no discomfort, wear them for a month (including sleeping in them), then replace. A hassle-free way of wearing contact lenses. Having used contact lenses for 48 years I was hoping for 24 hour use and no need to clean every night. It did not work for me, Having to clean and soak every night but still very comfortable to wear. These extended wear lenses are extremely comfortable and really can be worn continuously with no problems. Brilliant idea, I love waking up and being able to see straight away. Slightly thicker than dailies but that''s to be expected. These are my preferred extended wear lenses. Easy ordering, good price and sent quickly. Will use again. I wear these lenses for a full 30 days no problem. Would use no other - the best! I've been using these for years now. Leave them in longer than a month (which i'm not recommending) and they do no damage. The power i needs actually gone down since using these. Never had a problem with these lenses! Comfortable to wear all day long. My only problem that many times the lense broke, cracked while using them, only after a couple of days causing me pain. I suffer from a eye condition that makes me prone to infections. While using these I''ve not had any problems. They are comfy and let the eye breath. They save me hassle as they don''t need to be removed at night. Great for dry eyes. Usually take them out in the evening, but if I''m on a party weekend I can quite comfortably leave them in. Most comfortable extended wear contact lenses I have used. No scratchy eyes in the morning and no constantly spraying with moisture. So comfortable and easy to wear, I dont notice that they are there most of the time. Sometimes even forget that I am short sighted! !